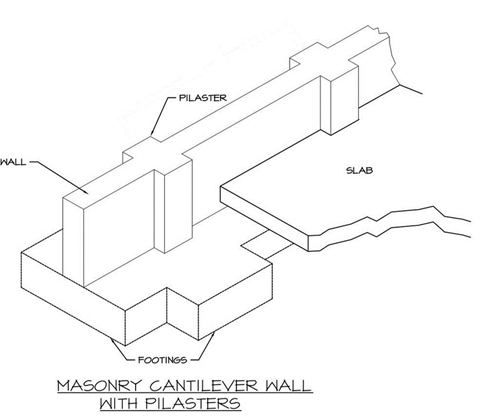 Figure 1: Typical masonry wall in wood frame construction. Recent developments in firewall construction demand some re-examination of the original purpose and functions of fire walls. Firewalls are, essentially, a tool for reducing the potential for fire to spread uncontrollably across a property. The original concept of ‘fire divisions’ was that fire would not spread out of the fire division under the worst conditions with no attempts to extinguish it. To achieve that end, the property would either separate buildings by sufficient spatial separation or subdivide buildings by firewalls such that the fire would be restricted to the fire division. Although the term building area is now used for this purpose, the principle is the same. The National Building Code of Canada (NBCC) defines a firewall as a fire separation that subdivides or separates adjoining buildings; such fire separations restrict fire to a prescribed degree and most importantly, have structural stability under fire conditions. It is important to differentiate conventional fire separations from firewalls. A fire separation functions as a barrier to protect against fire spread but is easily pulled down in event of collapse of the structure on either side of it. Such fire separations are also not continuous as firewalls typically have to be. You can rationalise this by regarding a fire separation as a shield against radiation and fire penetration. Other occupancies and occupants are protected against the immediate effects of fire but typically there will either be, for example, evacuation or intervention by the fire service before collapse occurs. In the case of firewalls, they will either stay in place or function to prevent total collapse and ultimately fire spread into the next building with no intervention by the fire service or others. In the NBCC, firewalls are typically 2 hour rated for occupancies equated with a lower risk and 4 hour rated for Group E (retail), F1 (high hazard industrial) and F2 (medium hazard industrial) occupancies. This does not preclude higher ratings for unusual high risk situations. Maximum Foreseeable Loss (MFL) firewalls- used by Factory Mutual and other large insurers- may be more onerous and generally apply to unusual structures such as large- scale industrial operations. In certain cases, horizontal offsets in a firewall may be required, which require special design consideration to ensure structural stability of offset firewalls in particular. To prevent fire spread around a firewall, firewalls in conventional combustible or non-combustible buildings generally require parapets (vertical extensions through the roof). The exception is where the roof is of reinforced concrete construction and has a fire resistance of at least one hour for a two hour firewall or two hours for a four hour firewall. This is somewhat of a relaxation over traditional firewall construction as in theory, the roof could collapse in over an hour leading to collapse of the firewall. The assumption is that the reinforced concrete construction should be less subject to collapse, damage and flame penetration due to its homogeneity. Although the Code does not permit combustible material to extend around a firewall at the ends, it does not require the provision of extensions which have been traditionally used to prevent involvement and ‘burn around’ of the firewall at combustible walls. 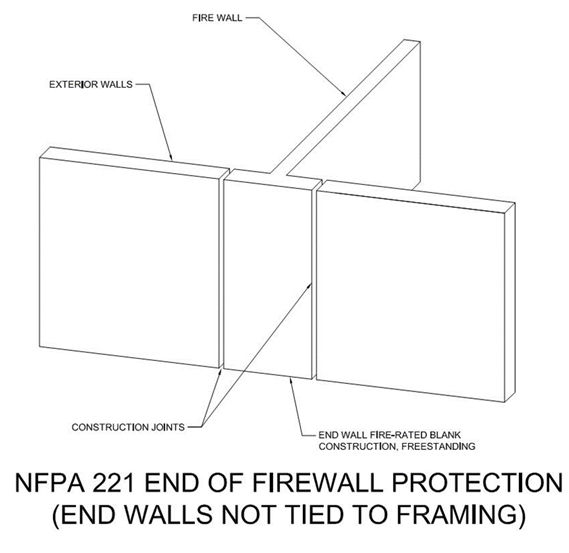 Traditional details by way of tees or extensions of firewalls through combustible walls are shown in Figure 2. Figure 2 Tee- section at end of firewall acts as fire-break. 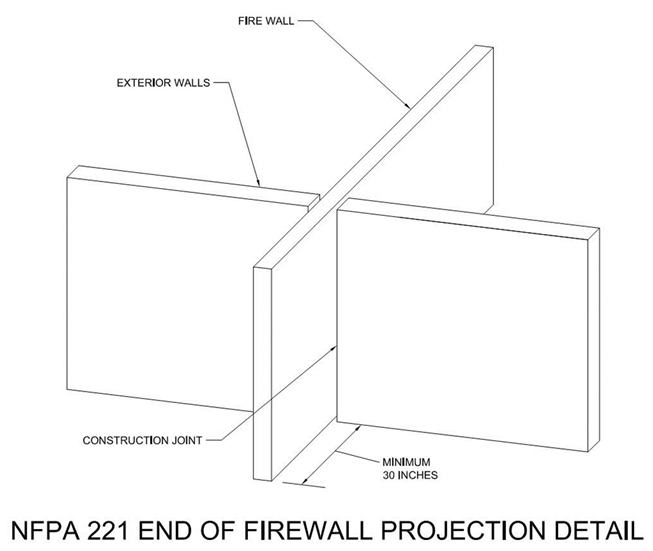 Figure 3 Projection through end of firewall to prevent fire spread around the wall. The NBCC requires that a firewall supporting structure that is supported on a firewall or connected to a firewall have the same fire resistance as the firewall so that structural failure of those supporting or connected members does not result in the collapse of the firewall. The exception is where the firewall consists of two back to back firewalls each tied to its respective building frame and designed so that collapse of one firewall will not cause collapse of the other. This is a typical arrangement of firewalls as each side of the firewall can be tied to the supporting structure in the normal fashion. Also, where an exterior wall has a fire resistance an addition can be made by having new independent wall on the new building of similar construction provided requirements for openings in the wall and parapets are met. Figure 4 Back to back firewall construction. Note that the only connection is at the roof flashing. It should be noted that the NBCC permits each firewall in this situation to have half the required rating of a free-standing firewall. This is a compromise as the idea is that with a collapse on one side of a building the fire spread will not occur across the boundary with no attempts to extinguish it. It is unlikely with a total burn-out that a one hour wall will be able to survive once the first wall collapses. Where back to back walls are provided, the original intent recognised that collapse on one side – with unprotected steel structure for instance – could occur within 10 minutes. In this circumstance, it seems unrealistic to expect half the required rating to be sufficient to meet the worse case criteria. The same relaxation is not permitted in the US. Since the 2005 NBCC, materials other than masonry or concrete have been permitted provided the assembly is protected against damage that would compromise the integrity of the firewall and provided the design of the wall complies with 4.1.4.17 of the NBCC. 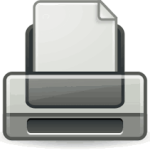 The Appendix A to Part 3 claims that the damage references damage occasioned in normal use. This is incorrect. The traditional use of concrete and masonry was to enable the firewall to resist the effects of collapsing elements some of which could become displaced by the collapsing forces. The debris pattern following collapse of a structure suggests that this is a realistic concern. The suggestion that this is a wear and tear issue may have arisen as a result of other concerns. In other occupancies, damage to firewalls is as a result of damage by vehicles – particularly those used for loading in warehouse and retail occupancies. However, the nature of this damage such as that experienced in carpet storage warehouses suggests that construction other than masonry or concrete would be even more susceptible to damage. Although most collapses exhibit a debris field in the footprint of the building, in the worst cases, debris has been discharged and deposited considerable distances from buildings. In progressive collapses, such as in the World Trade Centre, debris was displaced to 600 feet from the perimeter of the building. The suggestion is that the debris projection may increase with building height and the mechanism of collapse. For this reason, it is reasonable to provide structural and fire resistance to direct/localized impact from collapsing members and falling construction debris or other objects during a fire event. The reference to Part 4, Structural Design, references specific requirements to ensure the structural stability of firewalls. Firewalls are designed to resist the lateral design loads set out in Part 4 or a lateral design load of 0.5kPa under fire conditions. In Imperial units, this force on a conventional 100 foot section of wall 16 feet high translates to a lateral force of 16,700 pounds. Typically, firewalls are not designed for explosive pressures although this is stated as an objective in the NBCC. Where an explosion hazard exists other standards such as NFPA 68 for explosion venting may be utilised to vent the explosion and relieve pressures before they rise above the maximum tolerable pressures of firewalls. An important consideration in the design of firewalls is thermal expansion as well as allowance for movement due to seismic and other forces. 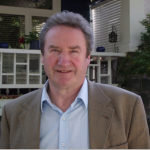 For further information on both thermal movement and structural deformation refer to the CCMPA paper on firewalls by Gary Sturgeon. The double firewall previously described. 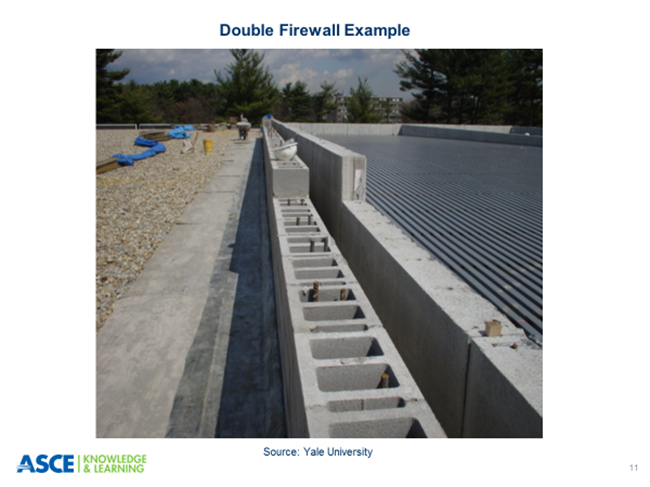 Figure 6: Typical double firewall- Credit ASCE Knowledge and Learning. Note the clearance between firewalls for thermal expansion, resistance to pounding under seismic forces. The cantilever firewall is essentially self-supporting with the only connection being at the foundation. As this system is dependant on vertical reinforcement the height limit is around 10 metres. As the wall is free-standing the roof is independently supported on each side. Clearance up to 150mm is required for thermal expansion and movement depending on height and length of bays. In tied firewalls, lateral stability is dependent on the building frame. The firewall may contain a single or double column. The pull of collapsing steel is resisted on the non-fire side. 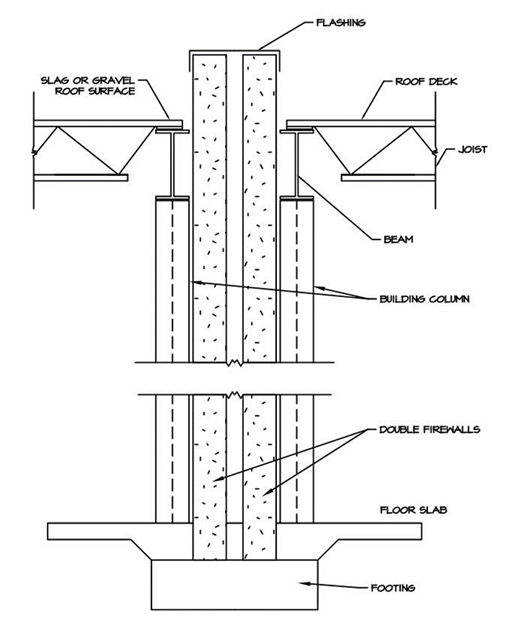 Figure 8 Tied firewall with double column or single column encased in masonry/concrete construction. By using weak link tied firewalls, structural components are supported by the firewall in such a way that the failing structure may collapse without damaging the integrity of the firewall. Weak link connections are used with tied firewalls where the wall is braced with wood construction. Where the wood joists run perpendicular to the wall, the joists can be fire cut to enable them to collapse away from the wall under fire conditions. This is common in traditional heavy timber construction. Further details are available in the CCMPA paper referenced above. 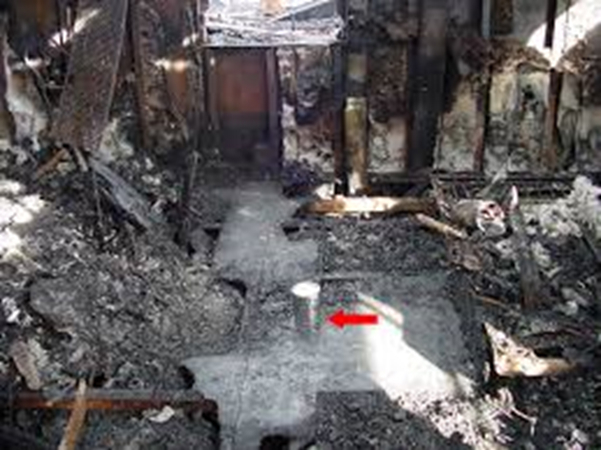 Firewalls are designed to prevent fire spread under worst condition with no attempts to extinguish the fire. Traditional firewalls have been constructed of masonry/concrete. The use of alternative materials – other than masonry or concrete – has been permitted since 2005 and will be addressed in our next bulletin. Structural stability is a key consideration and can be addressed in different ways by different types of firewall. 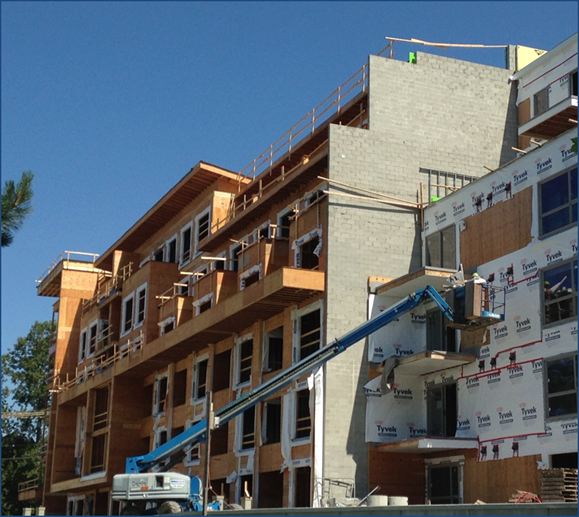 Walls are typically continuous and will have a 2-4 hour rating depending on the occupancy. Traditional firewall construction had good damage resistance to prevent against penetration of the wall by collapsing structure. Horizontal and vertical movement in walls arises from thermal and other effects- clearances are required to permit movement and prevent damage to firewalls. 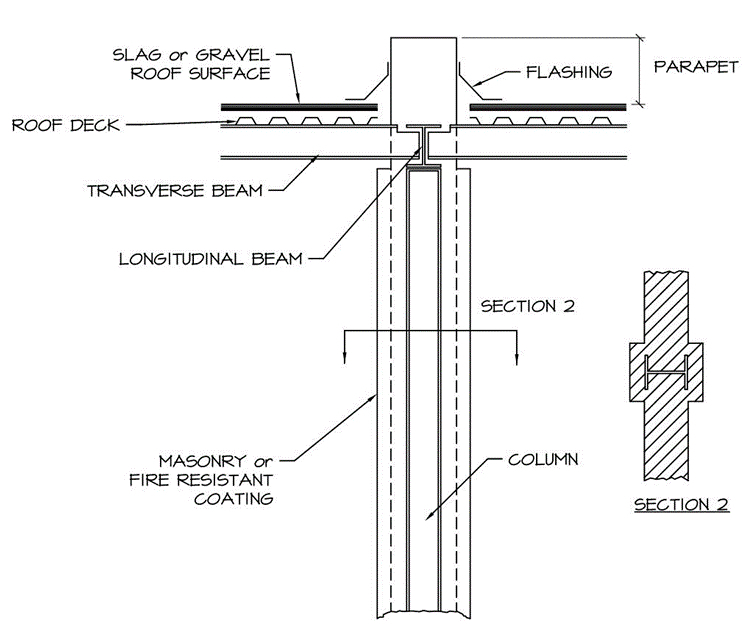 Parapet and end- wall details are important to prevent fire spread in certain types of construction. 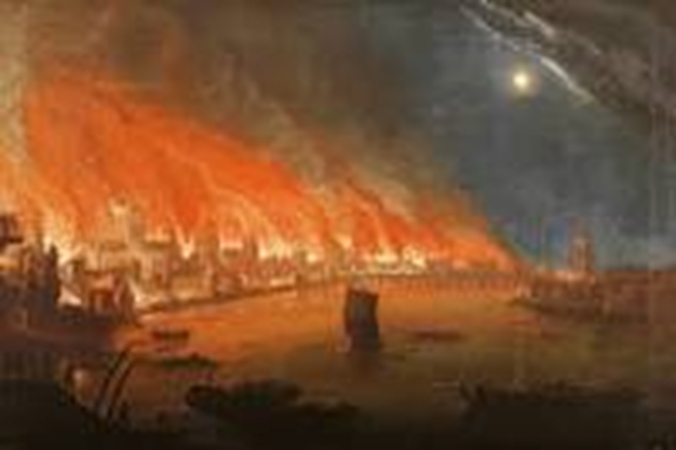 Figure 9: Painting of the Great Fire of London.